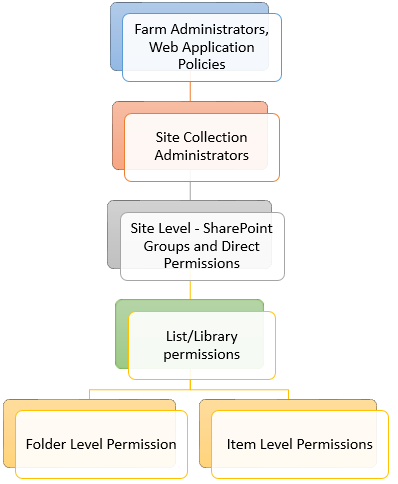 Permission management in SharePoint is always a complex task especially on large environments. Granting permissions in SharePoint becomes cumbersome when you are in a situation to clone an existing user's access rights. Consider this scenario: You have an existing user in a department granted access to various SharePoint web applications, sites, lists, files, etc. and when a new user joins to this department, You-SharePoint Administrator get the requirement of adding new user to all of the places with same access rights as the existing team member! Access rights may be via List item or folder level permissions. Well, To copy permissions from one user to another user on above levels, I've written this PowerShell script - It just scans all possible levels for given source user's access rights and grants permission to the target user. Important: You must run this script as Farm Administrator! Otherwise, you'll get "Access Denied" error!! This script iterates through each levels as in the above image and copies permissions between given users at List Item/Folder, Lists, site, Site Collection, Web Application and Farm levels. Just change the parameters for variables $SourceUserl, $TargetUser and $WebAppURL accordingly and run the script. You'll find the script outputs logs on the screen, on wherever it copies permissions. $SourcePermissionType = "'Member of SharePoint Group - " + $SourceRoleAssignment.Member.Name +"'"
$SourceUserPermissions = $SourceUserPermissions -join ";"
Write-Host "***$($ObjectType) Permissions Copied: $($SourceUserPermissions) at $($ObjectURL) via $($SourcePermissionType)***"
Write-host "Scanning Farm Administrators Group..."
Write-Host "***Added to Farm Administrators Group! ***"
Write-host "Scanning Web Application Policies..."
Write-host "***Added to Web application Policies! ***"
Write-host "***Added to Site Collection Admin Group***"
Write-host "Scanning Lists on $($web.url)..."
Write-Host "Permission are copied successfully!" This script just clone's user permissions at list level (copies at only list level, no drill-down to Folders and Items!). Please note, This script doesn't clone permissions which are granted via Active Directory Security groups! Wonderful script Salaudeen but for some reason it is not adding the target user to any groups my source user is a member of. Any ideas why that might be? I would recommend to run this script from FARM ADMIN account. Does it also check if the user is permitted by an Active Directory group? Or would it be possible to extend the script checking that and adding the new account using a sharepoint group or give direct access at that site/item...? Nope! This script doesn't clone Active Directory groups Permissions! Hi, great script, just the thing we where looking for. Sometimes it seems like my object is empty (Site/List/Folder/Listitem) how can that be? And ther is no check on limited Access permission level ==> had to catch try that block. Limited access can't be copied! AFAIK. Idd that's true, but you've should check on it no? GetType : You cannot call a method on a null-valued expression. Im getting the same error ?? Any resolution to this? What a lifesaver! Thank you! Clone-SPUser : Exception has been thrown by the target of an invocation. This is very excellent script however there is one minor issue. If the any user group has permission as "everyone" then in this case the script is adding the targeted user in this group where as this was not required to add. Wonderful Script which saved my time but i am getting below error message. Please help me to resolve. Thank you for the script. This is to clone individual users. How about bulk using a csv file? Thank you so much for creating this script. Does this script overwrite an existing user's set permissions in Sharepoint? Or does it just add extra permissions where an existing user may have had read permissions to a site? This script appends permissions to the existing one! The script worked well. However, it's little buggy. I have some groups where domain\all users are listed and this script added target user in the SP group. I had to do some clean up. Any idea for copy permissions between SharePoint groups?